Soak 8 wooden skewers in warm water. Mix the chopped fresh coriander, olive oil and sesame seeds in a large bowl and season to taste. Add the beef and peppers and toss to coat. Cover and refrigerate for up to 1 hour. To make the dressing, mix all the ingredients together and season to taste. Set aside. Preheat the grill or BBQ to a hot setting. If using the grill, line a baking tray with tin foil. 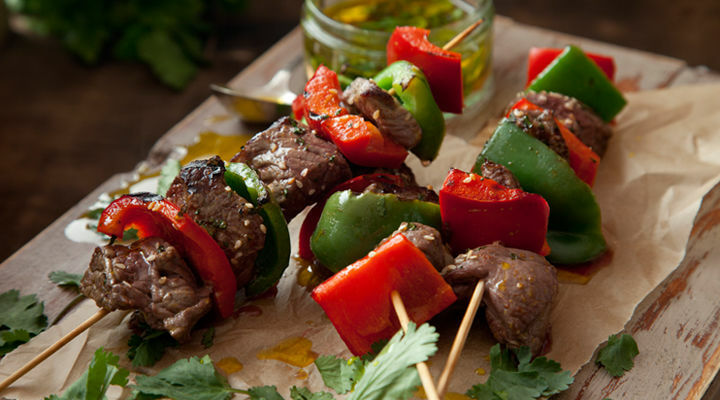 Thread a piece of beef onto a skewer followed by a piece of pepper and so on until the skewer is full. Place the beef skewers on the lined tray and grill for 15 minutes, or place them straight on the BBQ and cook for the same amount of time, turning often. Drizzle with the dressing and serve.